I'm not sure what the negative review from "Sally" is about because I absolutely love my ProVita. Ever since I got it, I've been juicing two times a day. I appreciate the photocopied manual. Perhaps demand for this product caused that. There's nothing more that is needed including a thick booklet. It surely doesn't diminish the quality of the appliance. When it came, it was pretty much set up, but I took it apart to make sure that I knew how to before I used it. The assembly is easy. I don't mind chopping up the veggies a little bit to make sure that my machine (whether I paid $89 or $399) lasts longer. I'm not sure what juicer on the market doesn't call for some chopping. I've ran carrots, cucumbers, tomatoes, spinach, kale, beets, celery, apples, sweet potatoes, ginger, oranges, lemons, watermelon, cabbage (to name a few) through this machine and have been satisfied. The only veggie I had trouble with was the sweet potato. It got jammed up in the machine and I thought it was broken. But I followed the instructions, unplugged it, cleared the sweet potato, plugged it back in and I was back in business. I've learned to cut even smaller pieces of the sweet potato to keep this from happening again. I was a little worried about the clean up, but that's what the little brush is for. I ran the drum and housing unit under running water while using the brush and everything came off of it. Yes, it looks like it's a pain to clean, but it's really not. It wasn't until the second day that I realized that the plug where the "waste" comes out actually opens for you to thoroughly clean. You have to be careful that you don't damage it when you remove it though. I can only hope that if you do damage it since it's screwed in, that you can replace that part if necessary. The two containers for liquid and waste are a perfect fit up against the machine where nothing spills on the counter or floor unless you don't have it aligned correctly. I've had no problem with this at all. When it gets full, I turn off the machine and dump it. But then again, I've only "over juiced" once. Most recipes you find or use don't come close to this issue. This machine is quieter than I thought. I'm glad I bought it, but wish I had bought a second for my son. So "Sally", I'd be glad to take yours off of your hand, but perhaps you've already listed it on EBay for more than what you've paid for it. The bottom line is that I'm super glad the Today Show had this on their Steals and Deals. I've been wanting a juicer for years now and couldn't get over the price of the good ones. This is definitely a good one. This is one of the best investments I've made recently. Now my husband and I are getting in a lot more veggies than we ever have. It's weird to go to the grocery store now and have a cart full of veggies. So thanks. A very good and reliable product. This is too glowing and well written of a review. Sounds like an employee posing as a reviewer. Who else would comment in a positive way about a photocopied manual? I got my ProVita through the Today Show Special and I was worried that it was going to be a waste of money, but I took the chance. I'm glad that i did! I get a lot more juice from the ProVita than I ever got from my Breville Juice Fountain. There are a few things you need to know to get the best out of the ProVita. First, the little rubber flap on the bottom of the clear plastic piece should be pushed into the pulp out slot before attaching it to the power base. Also, the manual says to alternate hard and soft fruits and vegetables and this is key to getting max performance. Make sure to cut things into small pieces (2" or less) and the juicer will extract maximum juice without getting stuck. I've never had to run mine in reverse. I've discovered that you should run foods with long fibers like celery and ginger at the end. The manual says do not run frozen fruit through the machine, but i didn't listen. I tried frozen bananas and frozen berries and i got the best sorbet I've ever had. Everything just comes out the pulp side and there is no juice. I have not used my Breville since i got the ProVita and i don't plan to. Like many others, I ordered my ProVita through the Today Show's Steals and Deals segment. I was very happy at finding a juicer for such a reasonable price of $89. I haven't been disappointed at all. There is some prep work involved, but I would expect this to be the same with all juicers. I haven't seen one that you just plop an entire fruit into, regardless of size, and press a button. I'm happy that all I have to do is cut to size - I don't have to peel anything or extract cores, and it's usually a few minimal, quick rough cuts to get the fruit to the right size to fit into the opening. The juices have been delicious and worth it. I didn't find it difficult to set up or clean. This is my first juicer, to I don't have prior experience with which to compare, but this one meets all my expectations and then some, and at more than 75% off retail, I was very happy. I also ordered on the Today Show steals and deals. I find it easy to use and to clean up. The paperwork attached is not clear, looks like ink was running out. Date ordered 1/15/2016. 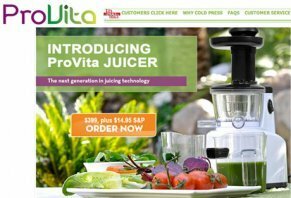 As with others on this blog, I ordered the ProVita from the Today show for $89 bucks. After reading some negative reviews, I was skeptical and was hoping that it wasn't a scam. However, it arrived in about 5-6 days, nicely packed, and we tried it immediately. Following the instructions, we learned how to assemble it (easy) and we insured that we placed vegetables and fruits in properly, taking thick rinds off limes or oranges first, and going slowly. Have to say, used it four times now, and the operation is very GOOD. It shoots the pulp out one side and the juice out the other. No problem with operation, however cleanup is time consuming, as it must be cleaned thoroughly after operation. The downside is that its made in China, you can tell its cheaply manufactured, and lacking style, but if it continues to work properly, I have no complaints! So far, so good, seems to be worth the $89. Received this juicer yesterday. I'm in love. Easy set up, easy to use, easy clean up (no more difficult to clean than a centrifugal juicer). The quality, and quantity of juice it makes is top notch. It's not loud, and it's a sturdy machine. Prep your fruits, and veggies as stated in the manual, and there shouldn't be a problem. I've already juiced carrots, and celery with ease. The only negative is the lack of information about it available on the internet, and the Provita website is pretty generic.